So we’ve just arrived in what I call the “heart of Australia“, the Red Centre in the Northern Territory, home of a big rock that goes by the name of Uluru. We took the long road here from our original base in NSW and have clocked up a cool 42,000 kilometres over the past 17 months. That’s a lot of hours behind the steering wheel so I thought I’d share a few handy tips for driving in Australia. You know, well most of you know that Australia is vast. It’s as large as continental USA but with a lot less people (22 million) and the road network is not as well developed, especially away from the coastal areas, and it can take a long time to get to places. Just as well I love driving. To me there is nothing better than the open road and there’s no better way to explore Australia than a road trip. Especially as a travelling family, I can’t rate them highly enough as a memorable travel experience. They are just so damn practical and generally cost effective. 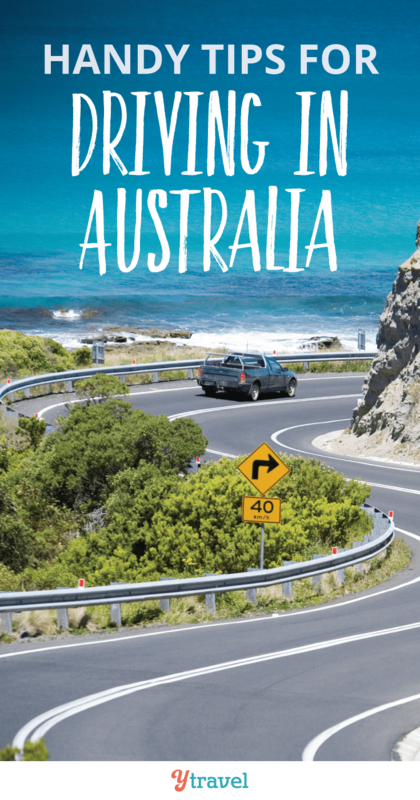 Lets get to the most important bit about driving around Australia. Most of you already know this, but just in case, we drive on the left side down under, which is the right side of the road for driving! Right?! Yeah, it even confuses me sometimes after having lived in the States previously for 4 years. Occasionally I still catch myself walking up to the wrong drivers side door, and if I’m on an unmarked road with no oncoming traffic I can have freak out moments of where I’m supposed to be. So remember, keep to the left! Just like any big city, Australia’s major cities can be congested, so it’s best to avoid driving in the Central Business District (CBD) especially during early morning and late afternoon peak times. And avoid driving in downtown Melbourne at all costs, otherwise you could find yourself driving up a one way street and staring head on with a tram and having the locals shake their head at you thinking, who’s this jackass! Get the tram in Melbs! Not much in the way of prices has gone down in Australia recently, luckily fuel has been one of them. For our foreign friends, we fill up at Petrol Stations, otherwise known as Service Stations, or colloquially “Servos”. At the servo we put petrol in the car, not gas! And most of the Service Stations are self-service, meaning, you will need to fill your car up with fuel, and then go into the Service Station to pay in person. After living in the States for 4 years, I miss the pay-at-the-pump option, especially with leaving young kiddies sitting in the car (take the keys with you). We need that option down here! 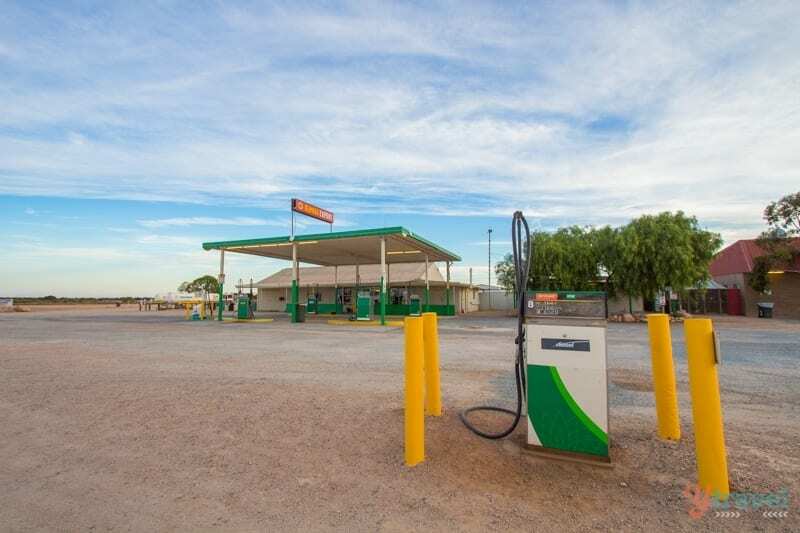 Most Aussie cars run off Unleaded Petrol (ULP), others (especially 4WDs and trucks) use Diesel, and a smaller minority of cars have been converted to Liquefied Natural Gas (LPG). Happily our Ford Territory is a diesel engine and since changing over from a petrol engine we’re now getting many more kilometres per litre of fuel. This increased fuel efficiency is very welcomed, and essential when your doing a big lap around Australia like us! 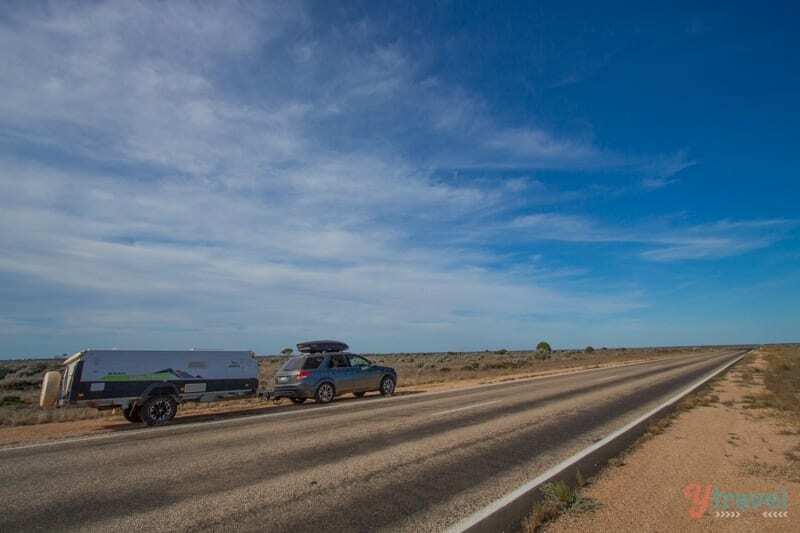 We’re averaging around 12 litres of fuel per 100km’s of travel, and that’s pulling a 1.5 tonne camper trailer. If you want to estimate fuel costs for various distances, Road Map Australia is a handy site. One handy feature of our car is the smart Trip Computer and the Distance to Empty feature which tells me the range (kilometres of driving) I have left with the fuel I have in my tank. It’s been super reassuring on long Outback roads knowing I can make it to the next roadhouse. Ensure your car is fully serviced and is optimized for efficiency. Check the pressure in your tires either with your own pressure gauge, or visit a servo. Correct tire pressure also helps with fuel efficiency and it’s best to check this when your tires are cold (before your drive too far) so you get an accurate reading. Try to drive at a constant speed without continuously accelerating and decelerating. We’ve done a lot of open road driving in the past 12 months and I love using my cruise control. But only use it when it’s safe to do so, avoid using on wet or slippery roads. Watch your luggage – the heavier the car the more fuel you’ll use. Pack inside your car not on top to avoid wind drag! Make use of your GPS to stay out of traffic jams. Use fuel discounts on back of supermarket dockets (receipts). Shop at Woolworths for Caltex servos and Coles for Shell servos. Keep the windows rolled up over 70 km/hr. Who knew, but apparently fuel efficiency drastically decreases if your windows are down creating wind drag, yes, it’s actually more cost effective to use the air con. 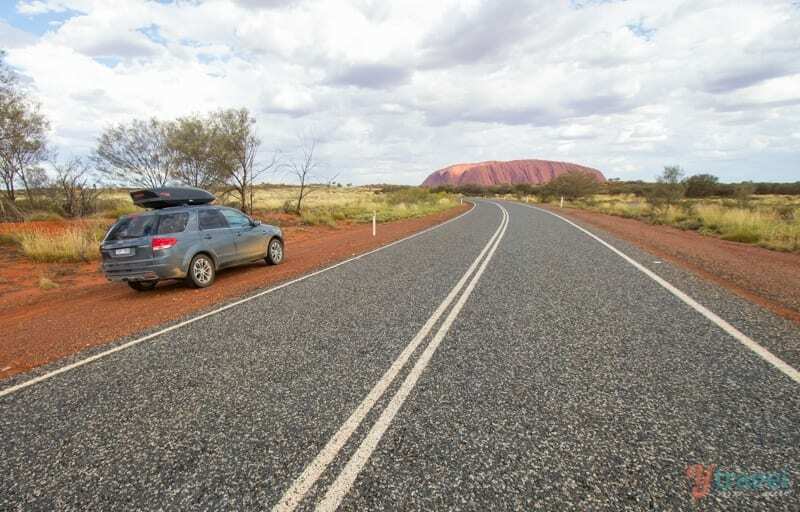 Thinking of driving in the Outback or remote areas, be prepared for anything. 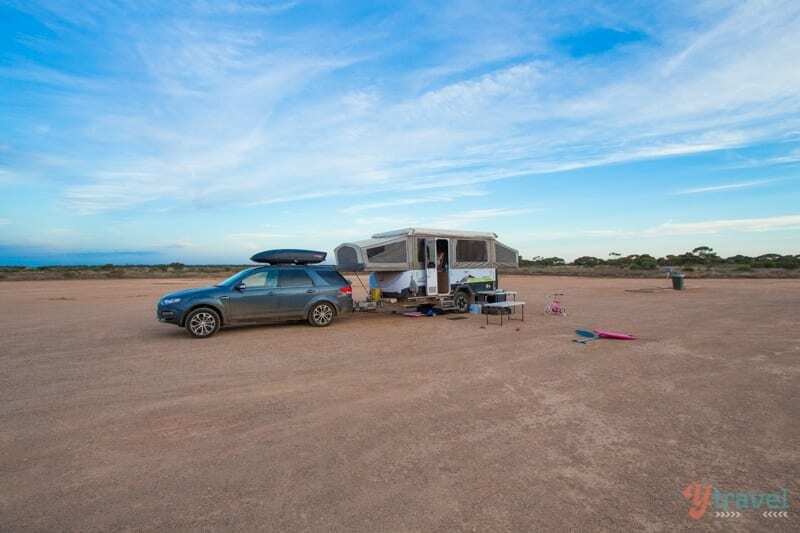 The Outback is filled with lots of space but few people and services, so there may be a substantial amount of time before anyone will pass you should you break down. It’s a desert out here and during peak summer months temperatures can reach 45°C (113°F) and over 50°C (122°F). Not conditions you want to endure without air conditioning. 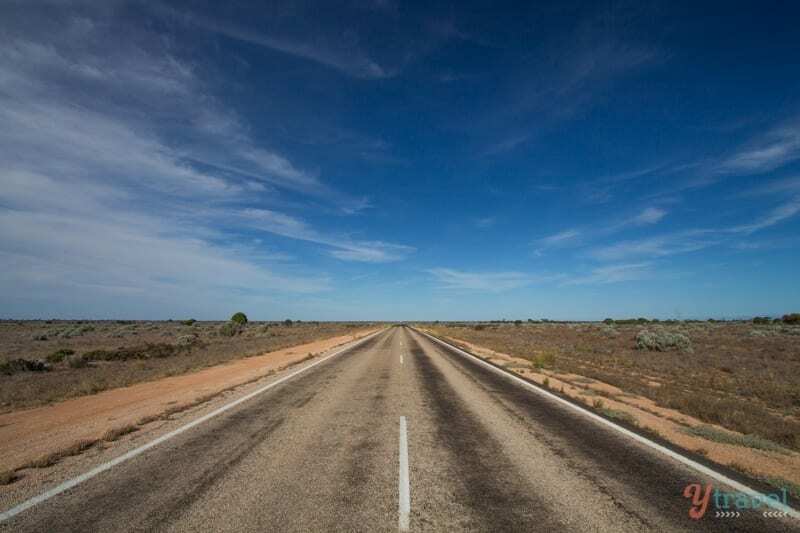 Last week we drove across the famous Nullarbor, Australia’s longest road. Some Aussies refer to it as the Nullar-boring but I actually enjoyed the SPACE and landscape. Roadhouses were typically at least 200km’s apart and you don’t want to get caught short of fuel. Always carry at least 10 litres of drinking water and additional food. Carry a 20 litre jerry can of extra fuel. Don’t assume fuel will be available late at night, in the early morning, or in some cases even on a Sunday. Even on some major regional roads, roadhouses may be closed late at night. On long drives I always fill up at every roadhouse even if I’m on half a tank! Don’t expect your mobile (cell) phone to work. Especially if you make the mistake we did and go with Optus, don’t, go with Telstra! Take advantage of truck stops and roadhouses for an overnight stay (at least grab a coffee) or simply pull over to take a nap if you feel drowsy. One helpful little feature of our Ford Territory is the “Rest Reminder” alert that goes of on my dash after every 200 kilometres. Road trains (multi-trailer trucks) are a special hazard in the Outback. These monster trucks can reach lengths of up to 55 metres, with up to four trailers, so treat them with care and respect. Oncoming road trains should be given all the space they need. Believe me, they stop for nobody, and even if they wanted to stop it takes them a lot longer than you. If you have to overtake, be sure to choose a nice long stretch of straight road where you have good vision of any oncoming traffic. Some truckies are even nice enough to signal the all clear! 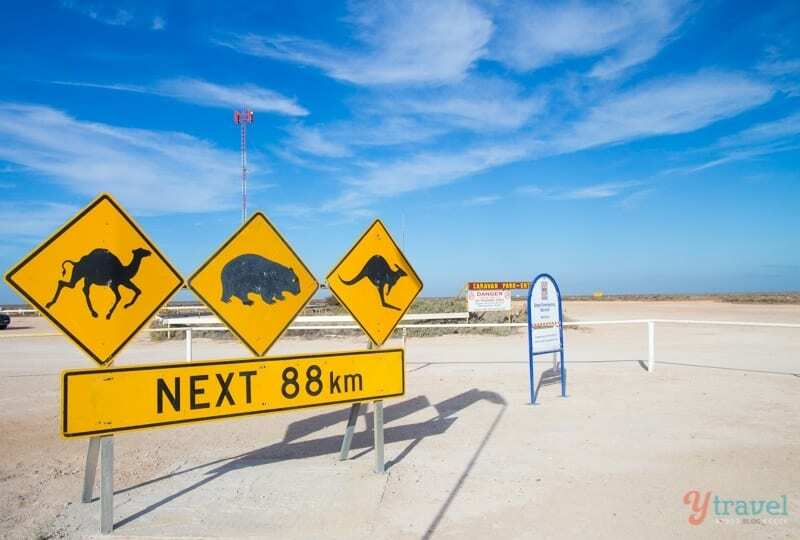 Australia is the land of kangaroos, emus, wombats, feral camels, horses, rabbits, and cattle, and unfortunately we’ve seen a lot of road kill on our travels. Often times these animals will wander onto roads and in the Outback you can be driving through massive cattle stations that are unfenced so keep a lookout for stock. Kangaroos are particularly dangerous and will hop across the road directly in front of your vehicle, and then hop along the road rather than hop off it. Emus also run across roads and have no sense of directions and how to get out of the way. Off the main highways many roads run adjacent to farms that are unfenced, and stock on the road are common. Your biggest concern is dawn and dusk and then into the night. Kangaroos, wallabies, emus, koalas and some bird life are more active early in the morning and in the evening when the temperature cools. If you can avoid traveling at dusk and into the night, but if you do make sure you are fully alert, and reduce your speed. Rig up a lean-to shelter and stay in it during the heat of the day. Dig a hole under the car and place your water & food in to keep it cool, it’s cooler under there than in your car. Build a small fire and have green growth on hand to place on top to create thick smoke, keep it going day and night to attract the attention of planes, other vehicles or stockmen in the area. If you don’t have any wood to start a fire, I’ve read that burning your spare car tire as a last option. It will give off a good smoke signal. Ration your food & water – you never know how long the wait could be. Use your rear vision mirror to signal passing planes by flashing it into the sun. Keep your clothes on as they will protect you against exposure – cold and hot. Stay with your vehicle – it’s far easier to spot than you and can provide some shelter. 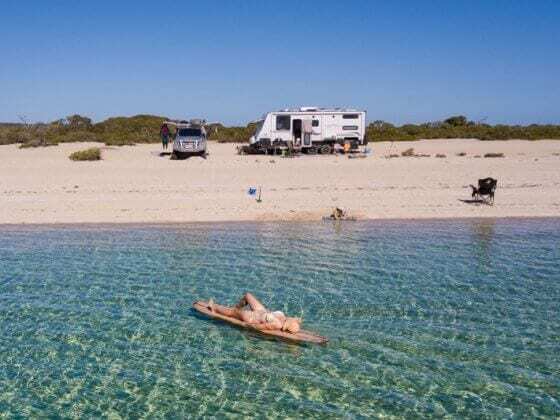 A regular car will take you virtually everywhere in Australia, but a four-wheel-drive is essential for beach driving or if you want to fully explore the iconic 4wd destinations like Fraser Island and Cape York Peninsula in Queensland, and the Gibb River Road in Western Australia. If your going to drive on sand, depending on how soft and deep it is you’ll need to deflate your tires which gives them a wider footprint. Start by deflating 10 psi, but a rough guide for beach driving is 15-25psi. 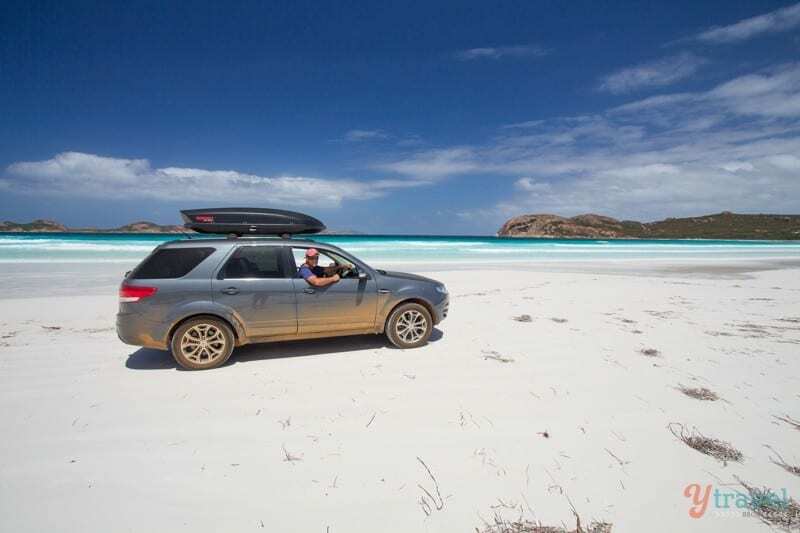 We’ve taken our Ford Territory, which is an AWD (all-wheel-drive), on plenty of unsealed Outback tracks and recently for a cruise on one of Australia’s most famous beaches, Lucky Bay in Esperance, Western Australia. Fortunately the sand on Lucky Bay is hard and compacted, almost like driving on concrete. We are the roundabout kings in Australia. They’re pretty much everywhere. I once drove to my friends house in Noosaville from Noosa Beach (a 10 minute drive) and I must have driven around 30+ roundabouts. They love a roundabout up there! In Oz we go around roundabouts clockwise, and when approaching you need to give way to vehicles already on the roundabout, that is, coming from your right. Remember that and you’ll be right! Fill the car up with gas (petrol) and your purse with cash. You don’t want to get caught in the middle of nowhere with neither. Take frequent breaks. Get out and stretch the legs, grab some lunch, and have a coffee every two hours. Remember this slogan…Stop – Revive – Survive. Stick to the road rules and don’t drink and drive ever. Don’t let your fuel level get down into the red zone, always keep it topped up. Remember it basically comes down to this: drive to the conditions, drive to your vehicles limitations, and drive to your experience level. Can you share any tips or stories on driving in Australia? Thanks for the tips. Just wondering if you’ve had to drive at night very often? My husband wants to buy some exxy driving lights but I don’t think we will need them because I can’t envisage us driving at night. Hi Cath. Yeah have driven at night in Oz many times over my lifespan. Along the coastal or urban roads that are well lit no problem. In the Outback or country roads you need to be wary of the wildlife and road trains! Better to always be prepared, especially out west and in the desert proper. Some good driving lights mean that you can see further ahead and out to the side of your vehicle, could mean spotting the roo or camel or other wide life before its in front of you. But best thing of all is to stop, the night sky out there is wonderful to look at, I spent many months sleeping under it and enjoyed every night, even when it rained. This is a really comprehensive article. I was pleased to see that you mentioned animals on the road. Tragically, a friend of mine and her boyfriend were killed last year when their camper van collided with a cow. They’d been driving along the Barkly Highway on their way back to Sydney from the NT. It just goes to show that, even on roads where there don’t appear to be many hazards, you should be vigilant at all times. On a lighter note, I’m glad you’ve arrived in Uluru territory. You will love it! I recommend the hike around its base. Hey Arianwen, sorry to hear about your friends. Just terrible. I’ve driven that very road. Definitely have to keep your wits about yourself for wildlife. Yep, we just did the walk around the base of Uluru. Was brilliant. Great article! I stalk you every day to see what’s new about Australia. I’m still deciding if I should buy my plane tickets to spend the summer over there. This is karma in action, I swear the timing of your post has freaked me out… let me explain. I started following you years ago when I was on a family holiday in Tenerife and I have enjoyed your emails ever since but I’ve never commented, never quite enough time to say what you want, or I couldn’t think of anything useful at the time – the usual excuses – but nevertheless I’m one of probably thousands of subscribers who dream a little when you get in touch. I drove the Great Ocean Road at Christmas when we visited our son who is doing a gap year in Melbourne. We left it too late to book somewhere and had to drive to Hamilton which we ended up doing after dark. I think its the scariest drive I’ve ever done as there were no street lights or traffic so we ended up driving quite fast through what seemed like farmland for hours. Just reading your guide about the risks of wildlife and Arianwen’s comment has made me realise how lucky we were! There were no ‘servos’ either and everything we passed seemed shut, it was like a ghost town everywhere. Why the serendipity? 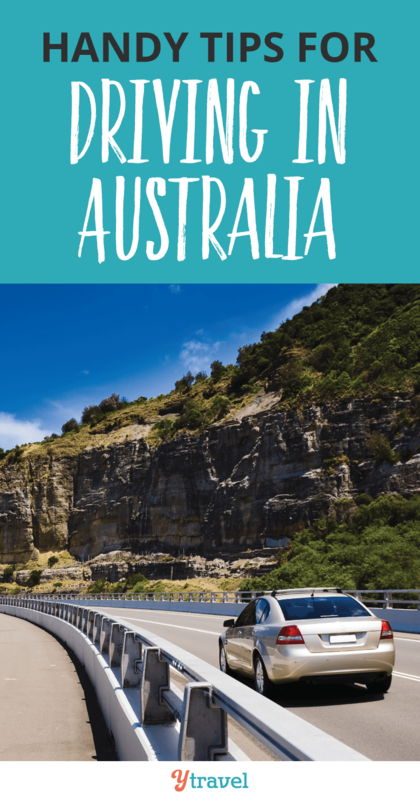 Well today I have started working on a project to find travel blogger tips for driving in various countries to feature them in an interactive guide I am creating and I thought of you guys first for Australia of course… then I see this post. Please can I quote a tip or two? Right now my favourite one of yours is the wildlife one as it stupidly never crossed my mind! PS we did house-sitting when we stayed in Melbourne and wow was that an eye opener in terms of making travel affordable, accessible and an amazingly positive experience. Anyways after all this time I thought I’d stop by and say hi – keep up the inspiration, its massively appreciated out here on the tinterwebs! Thanks for popping out to say hi Kath and I’m so glad you did avoid wildlife disaster! You can quote a couple of our tips. Thanks so much for asking! When towing always have lights on!! 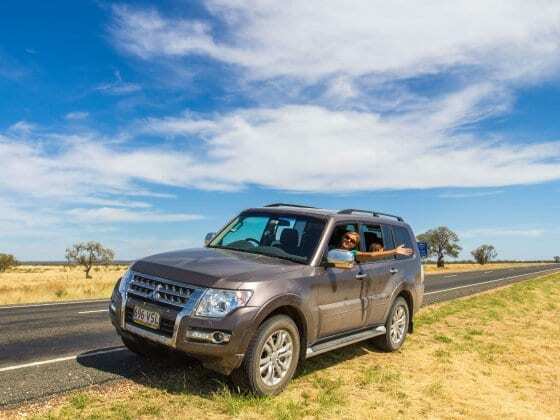 Okay, in addition to all the excellent advice contained in this article, anyone not experienced in travelling in the outback Australia, and if you are going off road, work out where you are going, the distances involved, how long it takes to do what you are you are planning, let someone know your eta by text or email or a phone call. All you have to do is give them a heads up and confirm that you will contact them on your arrival and that they should alert the authorities if you fail to contact them within 48 hours of your eta. Because, people have died off road and no one knew where to look! It is much easier to find you alive if they know where to look for you and if you are only a day or so late and well equipped. Yep, good advice Judith. Definitely need to keep your wits about yourself and be responsible driving in the Outback. The other thing to, most cattle stations have their homestead near enough to the main road that it can be found, if you get really stuck most if not all the managers will be able to help if you ask. If your short on water and can see windmills there is always water in the tanks near them (so long as the windmill is functioning) and if there is a petrol/diesel pump most of the time there is some fuel left near them so they can be started in an emergency, where I worked we did this for the drivers on the highway. Thanks for sharing this very helpful information! Your tips are valuable and that will serve as guide for readers. Great driving tips Craig! I agree with everything you said 100%. I would also add that when doing long drives, it’s always advisable to rest especially when you’re starting to feel drowsy. Pull over and get a power nap. Even a small moment of losing consciousness when driving can lead to a fatal accident. Keep safe everyone! Yep. Power naps are good! Whoops – “Liquefied Natural Gas (LPG)” – Liquified Natural Gas (LNG) is only used in buses and some trucks. It’s under VERY high pressure to keep it liquid. Cars use LPG (Liquified Petroleum Gas, mainly propane with butane, which US people would know as just propane) and, while it’s under pressure, it’s nowhere near the pressure for LNG. 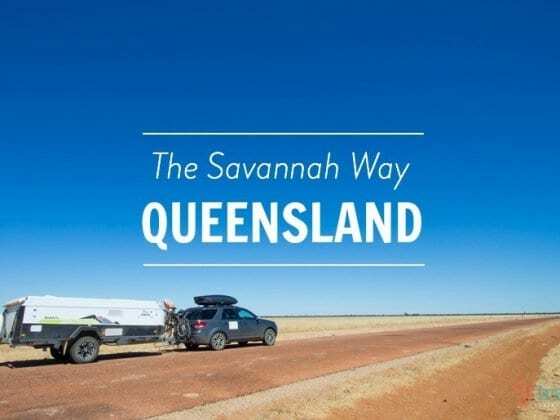 I’ve driven (and ridden) quite a bit away from the main cities (so I suppose that qualifies as “outback driving and riding”) and I’ve picked up a few things. Talk to travellers and the locals when you stop for fuel, food or a rest. Sometimes you’ll pick up tips on places to see or go that aren’t in the books or literature. If you’re in really remote areas, talk to any police you see. They have up-to-date road information and other safety information. If you travel on any unpaved roads, which may only have a vehicle every hour or so on average, invest in an EPIRB and/or a satellite telephone. It will only take one emergency and it’s paid for itself. Join the auto club highest level of care before you leave. Not only does it give you more breakdown benefits and longer towing distances, but if your vehicle can’t be fixed immediately, you get a subsidy or payment for accommodation. Again, one claim and it’s paid for itself. Thanks for the awesome tips Doug! Awesome tips Craig, this is really helpful for me. We are planning for road trips this weekend. I’m glad I found your post. My main concern is driving in night, I want to make sure I don’t bump any wild animals on the road. That’s totally scary, I want to make sure accident hire car is available when something happen. But, came from your tips and suggestion I am sure We will be fine. I have been reading your various blogs on Australia and have found them to be helpful. I would like a little info on where to buy incidentals such as sunscreen, toiletries, etc. As we will be traveling from the states, we will purchase some of those things after we arrive in Sydney to save on luggage weight. You can find them easy enough in our supermarkets. The two biggest chains are Woolworths and Coles.